The first year of the third generation Charger started off strong. A very comfortable, easy to drive, cruiser. The 383 magnum V8 runs very smooth with an excellent amount of torque; 409 ft-lbs stock! It is optioned out with hideaway headlights and a premium, luxury interior. It has a unique “receptionist tape recorder” option (see pictures) which included a tape recorder built into the radio. This would have been used to record yourself or conversations in the car on your way to work! With an ice cold A/C system, this car will be a head turner you can drive in cool comfort. The retro blue interior and wood grain dash is like stepping into a time machine back to 1971. Ready to be driven and enjoyed. The Charger "matured" a bit in this generation, basically becoming a 2-door personal-luxury car to the Coronet (much like the Chevrolet Monte Carlo was to the Chevelle). This generation Charger adopted Chrysler's new "fuselage" styling theme, becoming much more rounded and swoopy on the sides. It retained some of the previous generation's "coke-bottle" theme, but it was less pronounced. Chrysler's B platform was modified to meet new emissions and safety regulations. Available in six different packages with cosmetic changes that include: a split grill, semi fastback rear window, and a ducktail spoiler. 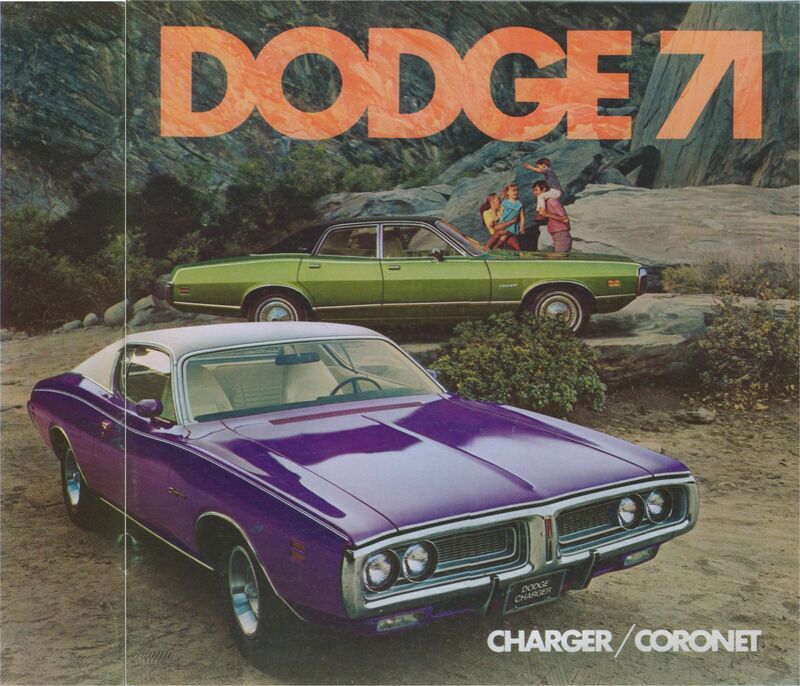 The increase in sales was mostly due to the elimination of the Dodge Coronet, which meant Dodge offered the two-door intermediate-size body style only as the Charger.